Home Mammals Are Mice Dangerous? Do They Carry Diseases? It is quite common to see mice scurrying across the floor. This is because they usually thrive in close proximity to human habitation. Despite the fact that mice mostly forage out in the wild, they often squeeze their way into homes, especially during winter. Due to their ubiquitous influence in urban environment, they have become quite regular intruders. Because of that, they are turned out to be common pests that create a lot of nuisance for homeowners. That’s why most people are curious about them and they wonder are mice dangerous or not? Let’s figure it out then! Are Mice Dangerous or Not? If your house is infested with mice, there is a lot to worry about. Some of the signs of mice infestation are gnaw or rub marks, mouse droppings and tracks. You cannot just sit back because if you spot one mouse in the house, there are almost certainly more than that. One of the dangerous things about mice is that once they get inside, they tend to multiply at an alarming rate. The availability of abundant food and warm shelter makes perfect place of abode for mice during fall and winter. That’s why it is highly recommended to take immediate action because if mice infestation get out of control, it would be difficult to deal with. Learn more: Are Mice Blind? Mice are cute little scavengers and they tend to nibble at pretty much anything. Since they are nocturnal mammals, they are most active after dusk and seek out food when everyone is asleep. Hence, as night fall, they come out from hidden places in large numbers and take small bites out of leftovers. But by gnawing at the food with their ever-growing teeth, they contaminate the food with mouse feces. Learn more: Are Mice Nocturnal? If you consume food containing salmonella, you may catch fever. Some of the other symptoms of food poisoning are abdominal pain and diarrhea. Moreover, mice can also become carriers of other pest organisms like lice, fleas and ticks. As compare to rats, house mice may not be that much dangerous for human health. However, they are considered as serious pests for good reasons. They pollute human food through mouse droppings. As they walk over kitchen cabinets and pantry, they pick up bacteria along the way and as a result, may poison the food substances. Apart from infecting food substances, mice may also play havoc with woodwork, upholstery, furniture and clothing. They are inquisitive by nature and do not hesitate to gnaw at different materials. Because their teeth continue to grow forever, they bite off furniture to curtail its growth. Mice can also cause severe damage to electric cords. Learn more: Can Mice Climb Stairs or Jump? The presence of mice in house itself may pose significant threats to your health and can become source of dangerous allergies. Some people are allergic to mouse droppings. But the mice poop is even more dangerous because it carries quite a lot of pathogens like Salmonella, E.coli and C. difficile. House mice can also cause a number of diseases that have serious concerns for human health like rickettsial pox, Salmonella (food poisoning), murine typhus, tularemia and bubonic plague. If mouse feces are somehow added to the human food, you can easily catch infectious disease filled with harmful bacteria by consuming that food. Besides, a dead mouse is equally dangerous if you come into contact with it anyway. One of the nasty things about mice is that they tend to urinate quite often to mark their place. Therefore, if you are suffering from mice infestation, there are chances that you may have to see messy stuff like mouse poop. 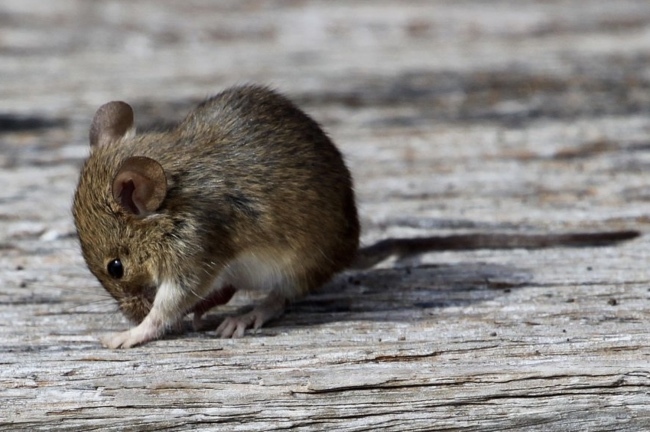 A mouse feces or poop can transmit virus to humans called Hantavirus Pulmonary Syndrome. This kind of virus is more commonly found in the urine and feces of deer mice. Some of the symptoms of this virus are fever, pains and aches. It may also lead to kidney-failure once it gets out of control. When the mouse feces gets dry, its particles may rise into the air as dust and can still transfer this virus. According to latest research, mice can also carry virus that may cause breast cancer, called the mouse mammary tumor virus (MMTV). Occasionally, however, they may also cause rat bite fever. According to a latest study on mouse droppings, scientists find that mice can also transmit antibiotic-resistant diseases to humans. In simple words, this means the use of antibiotics can turn out to be ineffective at best. Such resistant microbes are known as “superbugs”. Mice may also carry ticks that may in turn, become cause of Lyme disease and Colorado tick fever. Apart from ticks, mice also carry fleas that drink blood. Thus, fleas and ticks can potentially transmit dangerous diseases. Finally, apart from spreading some of the harmful bacteria and diseases, mice can cause extensive damage to your home furniture. Besides, mice can also become a source of erupting fire due to electricity because they often chew electrical cords or wires.